A great way to wrap up the ''season''. 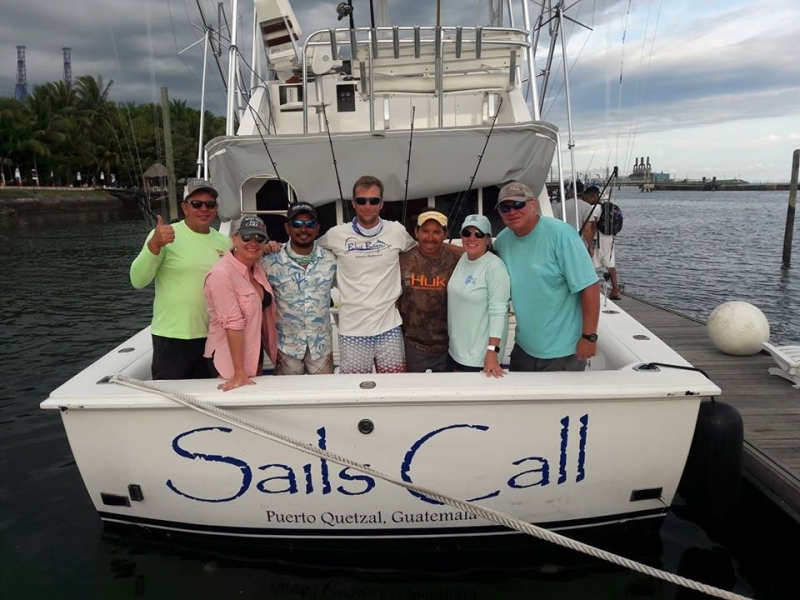 Confirming once again, the sailfishing is a year round thing in Guatemala. It did take some searching, but day 3 we found some fish for our group from Dallas Texas. 37-28-23 Sailfish at 44 miles. Sails Call is being pulled for a month of repairs and preping for a very busy season! Thank you all for a great season!!! We closed the month with a great group of guys from Houston, Texas. Father and Son group that yielded incredible billfish numbers. Last 3 days of July, 2017. 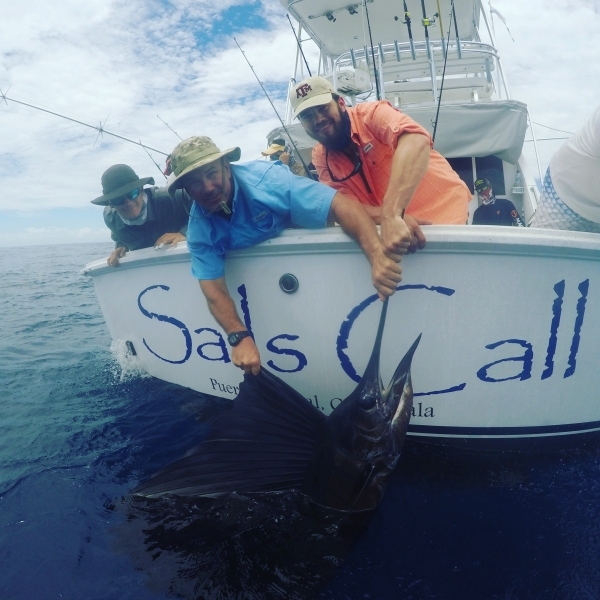 Day 1 ''We Found Em'', saw over 52 sailfish in the spread, 44 bites, and 28 releases. As well as 1 nice bull mahi and yellow fin for lunch. Only boat and lodge fishing these days, in fact our offseason has been the busiest and most productive in years. Day 2 ''Lets pick up where we left off'', we went right back to the spot, they seemed to move inshore a few miles, not as hot as yesterday, but still a very good day none the less. 42 raises, 32 bites, and 15 releases. Day 3 ''WE WANT A BLUE! '', that's right we left a damn good sailfish bite to get that blue marlin flag. We were baically 180 degrees straight out the first two days 30 miles. Since the blue water looked good on the charts to the east, a known marlin spot, we decided to run there for Day 3. If you wanted marlin, that was the spot. We weren't 40 mins into the troll when our first blue show up, no bite. 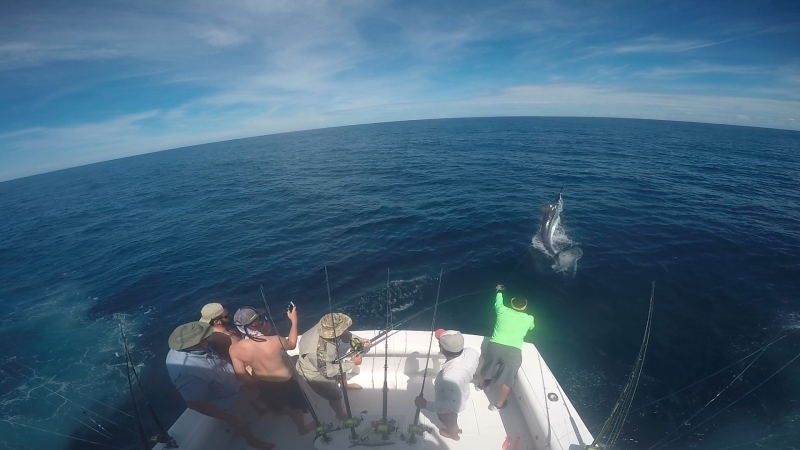 Few miles more a double header of blue marlin showed up, with a 3rd sailfish on the rigger. The smaller blue didn't eat but the sailfish off the rigger did, and then finally about a 400 lb blue ate the pitch bait!! Both released. Mission acomplished! Stay thirsty Blue Bayou Nation!